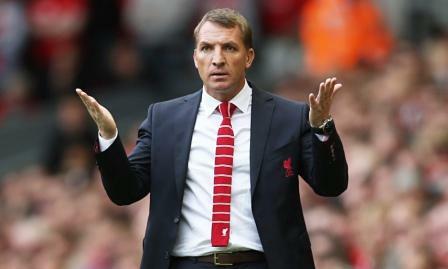 There’s been a lot of talk lately about whether Brendan Rodgers is the right man for the Liverpool job. Losing two and drawing one in your last three matches against Aston Villa, West Bromwich Albion and Hull City when you are fighting an uphill battle never helps. I spent a lot of free time in the last few nights thinking about what really is the issue with our club, and as I typically do when a question gets in my head I starting compiling research. This article will be the first of a two-part series addressing the state of Liverpool Football Club. First I look at team management, specifically Brendan Rodgers. Next week I will try to address team ownership. Hopefully I can help peel back enough layers to expose the reality of where we stand as a football club and legitimate contender for titles. You can’t get into any conversation about LFC team management without raising someone’s blood pressure just a little. It’s been a heated debate, but should it be? Has Rodgers been a success? I’m not just talking about this season or last season, but overall has he been a successful manager? Detractors immediately point out the obvious metric: he’s never won a trophy. That’s certainly true, but hardly fair. Had Liverpool won the FA Cup or League Cup this year and still finished 6th then it would be no different from Kenny Dalglish’s 2011-12 season at the helm. Still you can point out that King Kenny’s run to the Cup was an impressive one. Liverpool won four successive away matches, including a 2-0 quarterfinal win over eventual Champions League victors Chelsea at Stamford Bridge. Then we defeated eventual Premiership champions Manchester City 3-2 on aggregate in the semis. It was a great run that resulted in a trophy. This season we struggled to advance in the Cups with a penalty shootout win (Middlesbrough) and replays against teams from a lower tier (Bolton and Blackburn). The only time we faced a legitimate top club in two Cup competitions, we lost to Chelsea in the League Cup semifinals (albeit in what could be considered our best performance of the entire season). Would you honestly think that winning an FA Cup that had us run through the gauntlet of AFC Wimbledon, Bolton Wanderers (twice), Crystal Palace, Blackburn Rovers (twice), Aston Villa and then finally a top club in Arsenal could save our season? How should you define success? For me the only true barometer of success is measured in the Premiership for two reasons. First reason is that the 38-game season is nearly three times more than what you play to win the Champions League, so you have a larger window to maintain your performance. The second reason is more personal to me, as it is the only major competition that I have yet to see Liverpool celebrate winning. Yes it was nice to win our 5th European Cup in 2005, especially in such dramatic fashion. People tend to forget how much of a struggle that campaign really was. We finished second in a group that included Monaco, Olympiacos and Deportivo… even then needing a world-beater goal from Steven Gerrard late in the final group game against Olympiacos just to advance. We lucked out in the knockout stage getting Leverkusen before finally stepping up in class against Juventus and Chelsea. In all 13 games played that competition we won seven, drew four times and lost twice. If you extrapolate those results over 38 games, then Liverpool earned the equivalent of 73 points against a group of clubs where the majority would be considered inferior. At the end of the day it’s still “mission accomplished” and another trophy for the cabinet, but you’d be hard-pressed to convince most people that they were a dominating force in that campaign. For me success is best judged looking at results in the Premiership. If you’ve ever read any of my blogs, you know that I try to make judgment based on quantifiable metrics as opposed to qualitative analysis. I’ve been to the pub enough times to hear numerous opinions of how Rodgers is mismanaging the roster. Show me some numbers to prove your theory. Don’t just give me a blanket statement like “he will never win with a single striker.” This article isn’t about what formations work and what players are not playing in their best position, although I admittedly enjoy a good debate over a few pints of Guinness. I prefer to take a big picture overview. How did the team finish in the league compared against realistic expectations? Forget how much money is spent on transfer fees. In my opinion the best way to judge team strength is total wage bill. A team that spends £200M on their player roster ought to perform better over 38 games than a team that spends only £100M. In theory the team with the highest payroll should win a 38-game league while a team with the lowest payroll should get relegated. The obvious faulty assumption is that a player’s ability is commensurate to his wage rate. We know this is not the case when you compare Radamel Falcao’s £350K weekly wages against his performance this season; conversely you can do the same with Raheem Sterling’s £35K weekly wages where he is clearly outperforming. While you may have some anomalies in contract wages, in general the overall wage bill is a good indication of how strong a team should be. So if I am going to judge the success of a manager, I will look at his ability to punch above his weight class. If you have the 5th highest wage bill in the league, a successful season is one where you finish above 5th place in the league standings. When you look at the above chart, most people will take note of the drastic increase in wages paid out by Manchester City starting in the 2009-10 season. This meteoric rise coincides with the September 2009 acquisition of the club by the Abu Dhabi United Group led by Sheikh Mansour. I’ll get into that discussion more in my next blog. For now though I want to focus on where Liverpool sits on this chart for the past few seasons: solidly in 5th place. Throughout this spell, Rodgers has led the team to finishes of 7th, 2nd, and 5th place (if they can somehow right the currently sinking ship). Only once in three seasons will he have outperformed the expectation. Batting 0.333 may be good enough if you play left field for the Boston Red Sox. That’s not good enough for the manager of Liverpool. Should any of this be a surprise given his past history? I guess we can take a look at his resume and see for ourselves. Brendan Rodgers first became a head coach for Watford in the 2008-09 Football League Championship. That team was woeful when he took over in November, and he only won two of his first ten matches there. Somehow he was able to get that train back on the rails and finish 13th place out of 24 teams for a respectable mid-table finish. It’s hard to judge whether or not he outperformed expectations based on wages, so let’s just ignore that first season and claim that he certainly didn’t underperform. The next offseason saw Rodgers depart Watford to take over at Reading Football Club, his former club. That didn’t last well as he was sacked by December, clearly underperforming expectations. After a few months unemployed, Rodgers returned to lead Swansea City in their goal of promotion to the Premiership. Wage bills in the Championship typically vary from £35M down to £5M. In 2010-11 Swansea City had a published wage bill of £17.4M, the 7th highest in the division. Middlesbrough (£36.3M) and Queens Park Rangers (£29.7) were paying the most wages, while Hull City (£21.2M) and Reading (£20.5) rounded out the top four respectively. After that you had eight total clubs that within 10% of Swansea City’s wage bill. That’s a total of twelve teams with serious aspirations and means to be one of only three teams to get promoted at the end of the season. The Swans finished 3rd and ultimately advanced through the playoffs. 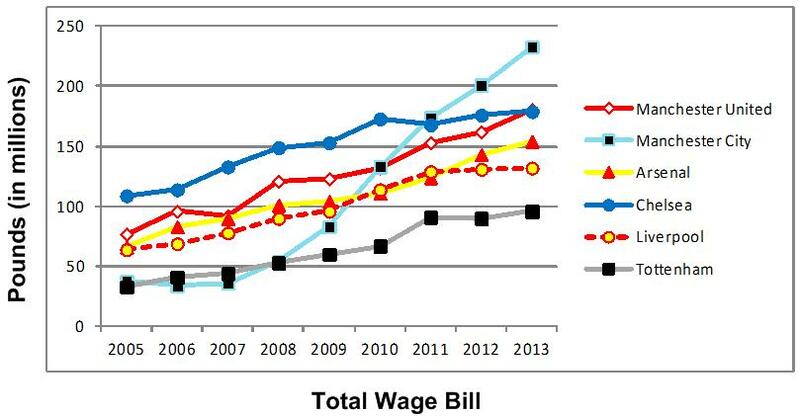 Clearly that season Rodgers outperformed the wage expectation. Rodgers next led the Welsh club into their first season ever in the Premier League. Ownership doubled the wage bill from £17.4M to £35M, but that still left the club with the lowest wage bill in the top flight. Somehow Rodgers was able to get that team to finish 10th place at the end of the season with 47 points. If you take it a step further and look at the ratio of points to wages, you’ll note that Swansea City earned 47 points with £35M in wages, or 1.34 points per £1M in wages. League champion Manchester City got 89 points with £202M in wages, or 0.44 points per £1M in wages. In fact, no team that qualified for Champions League was able to better the league average of 0.64 points per £1M, but Swansea ranked tops in the league, more than doubling the league average. Not only did Rodgers outperform that season, he did it better than anyone else. Thus far I’ve only learned that Liverpool was justified when they hired Rodgers in the summer of 2012. In two seasons at Swansea City he clearly outperformed due to the financial limitations imposed on his club. Apparently we may be seeing that it’s a little more challenging to outperform financial expectations at a larger club like Liverpool, who play under a significantly larger microscope. As we pointed out earlier, he’s only outperforming 33.3% of the time. Will Fenway Sports Group accept only making Champions League once every three years? I hope not. That’s not good enough for the manager of Liverpool. IF NOT RODGERS, THEN WHO? I’m still not sure what FSG will do about Rodgers, but let’s say for a moment that changes are coming. Who can they get? Many people are enthralled at the prospect of bringing Jürgen Klopp to Merseyside as he’s already announced his intention to leave Dortmund after the season. Should we be excited? The numbers will tell the story. When you look at this resume, the first thing that I notice in his 15-year management career is that he’s managed exactly two clubs. From 2001-08 he lead FC Mainz before taking over Borussia Dortmund from 2008-2015. That shows loyalty and dedication, something Liverpool desperately need. What about the results? 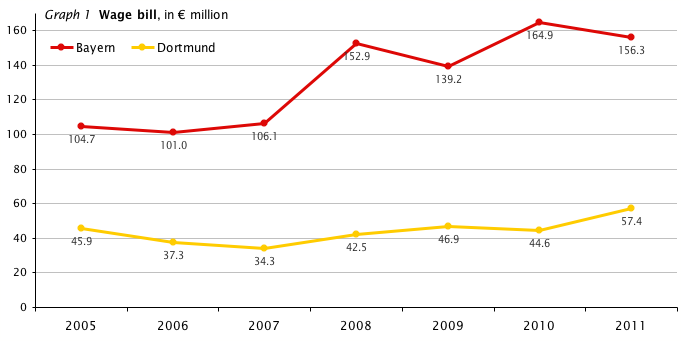 Prior to taking over at Dortmund, the German club had league finishes of 6th, 7th, 7th, 9th, and 13th respectively. Then they hired Klopp and in his first two years at the club he led them to a 6th and 5th place finish. After that the unthinkable happened. He won the Bundesliga in 2010-11. Look at it a different way. In only three years, he took a team that was fighting off relegation to a league championship. It clearly has to be a fluke, right? Wrong. He repeated the feat the very next season. Two more 2nd place finishes and a spot in the 2013 Champions League final followed those two Bundesliga crowns. That’s an impressive resume. Clearly Klopp knows how to win, but how does his club wage bill compare to the rest of the league? To be fair, the club plays in a stadium which seats over 80,000 supporters (the most in Germany). According to figures obtained from their official accounts, Bayern Munich routinely pay their players more than twice what Dortmund has been paying. The figures in the below chart only go up to the 2010-11 season, which happens to be the first time Klopp led Dortmund to the crown. And then he did it again. 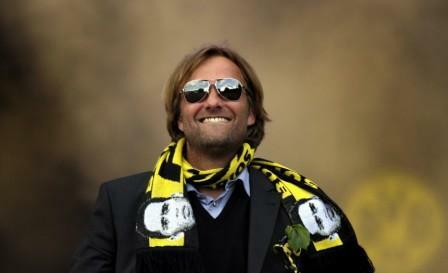 Without wasting any more of your time, I think I can rest my case that Jürgen Klopp would be the right hire. Lastly I want to mention one final footnote to this discussion. When you look at the numbers for the past 15 seasons, Liverpool have started each season with five different managers (Houllier, Benitez, Hodgson, Dalglish and Rodgers). While Houllier was able to consistently meet expectations finishing in the same spot as the wage ranking, Rafa Benitez outperformed in three of the six seasons at the helm. The first year he finished 5th place while somehow managing to navigate the club to a fifth European Cup, and the only other underperformance was his final season with the club as Hicks and Gillette continued to pour gasoline on the burning financial crisis they started with their 2007 leveraged buyout of the club. Benitez left the club only a few months before FSG acquired it. He still maintains a residence in Merseyside, so the club could even save a few bucks in relocation expenses! Before you tell me that he’s under contract with Napoli in Serie A, let me remind you that if Brendan Rodgers honored the contract extension he signed in February 2012 he’d still be managing Swansea City. If FSG can’t get Klopp to come to Liverpool, then give Rafa a call. He’s not a bad plan B. Should Rodgers stay or should he go? If it were up to me, I’d make a run at both Klopp and Benitez. It’s not personal, it’s business. If you can upgrade at any position on the pitch, why wouldn’t you? Shouldn’t manager be a position included in that conversation? In this day of technology and social media, it is nearly impossible to start down that path without media leakage, but I still think it’s worthwhile to try. If FSG fail in this endeavor (and nothing about their recent history to acquire top talent indicates otherwise), then your fallback position is simply to tell Rodgers to honor his contract and prove the naysayers wrong. Not a bad plan C.
Stay tuned for my follow-up to this article when next week I will attempt to take a quantitative approach to reviewing the ownership and overall administration of Liverpool Football Club. Until that time, get on down to the pub and cheer the Reds to victory! Some extremely winnable games are ahead of us, and a top six finish still secures European football next season, which is better than nothing. Up the Reds!! ← Is FSG Doing Enough? 2 Responses to Should He Stay or Should He Go?? ?